Aspen View is a neighborhood south of the town of Breckenridge on the east side of Highway 9, and is adjacent to the national forest. These large homesites are part of the small town of Blue River, and that means homeowners have the liberty to use the town's Goose Pasture Tarn, pictured below. Aspen View is a small neighborhood, with one central road, Davis Court, and situated in pine and aspen forests. Any home for sale in Aspen View will be naturally private and have easy access to ski and hiking trails. National Forest is out the backdoor of anyone living in Aspen View. Red Mountain is the name of the peak to the east and can be climbed with a little bushwhacking. Fredonia Gulch is another trail on this side of Highway 9 but is a short drive to the north. To the south are trails like The Bemrose Ski Circus. Being part of the town of Blue River, homeowners in Aspen View are free to use Goose Pasture Tarn, the small lake on the north edge of this little town. Across Highway 9 from Aspen View is the McCullough Gulch Road, which doesn't continue very far, but offers parking for a trail up and along the creek McCullough. 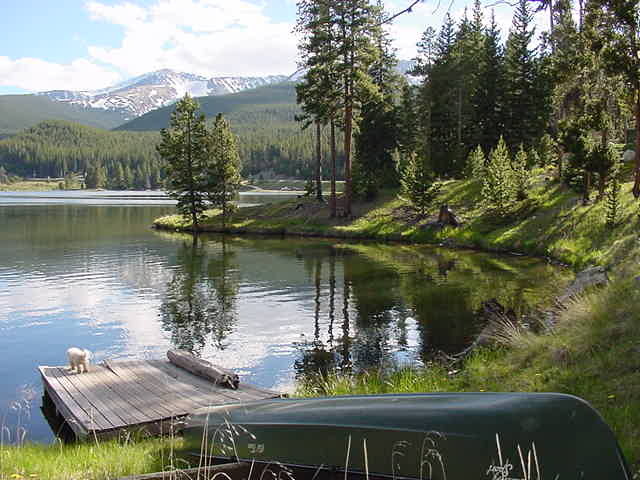 Spruce Creek Road, a gateway to great trails to popular destinations like Mohawk Lake, is also on the other side of the Highway and less than a mile north of Aspen View. Take the U.S. Forest Service Road that Spruce Creek or Crown Drive funnel into, and you'll arrive at the Spruce Creek trailhead, which connects to the Burro Trail which leads back to the base of Peak 9. Further up the trail, you'll cross the Wheeler Trail that extends from Hoosier Pass to Copper Mountain, and there you can see stunning Continental Falls that flow from the lakes situated in high meadows at the foot of the Tenmile Range. Square Footage: about 2,000 to 6,500 sq. ft.
South on Highway 9 towards Blue River, turn left onto Silverheels Road and left on Davis Court.